Blockchain is an emerging and transformative technical standard for distributed ledgers, which has the potential to streamline transactions. Join us to learn about how blockchain can interact with new and existing renewable energy markets. This new technology is used to create a permanent, digital ledger of transaction data. Blockchain is used in many cryptocurrency platforms, but the underlying technology has the potential to be used for many other types of applications. One of these potential applications is renewable energy certificate (REC) transactions. What types of efficiencies can be gained by using blockchain in this context? How might this work within the current renewable energy policy landscape? 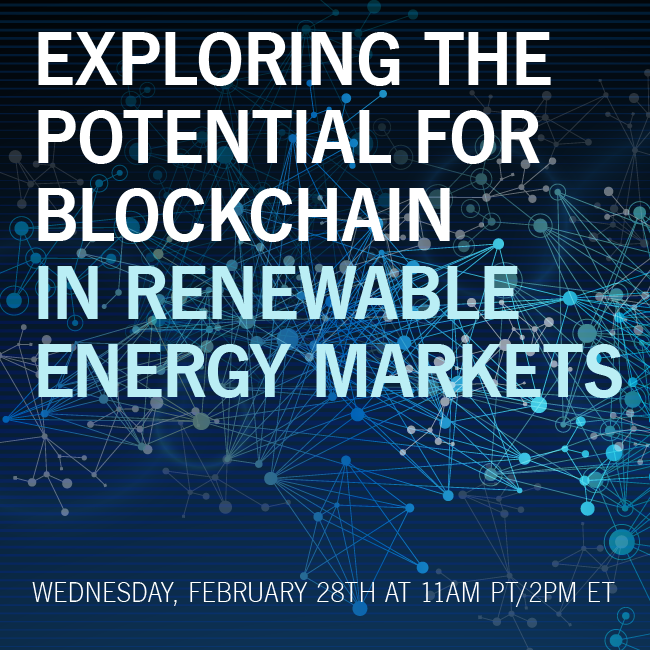 Join us in this free webinar to discuss some of the opportunities and challenges of integrating blockchain technology into existing and emerging renewable energy markets. This content is back by popular demand from the annual Renewable Energy Markets conference. Learn more about this year’s conference at www.renewableenergymarkets.com.